Uluru Kata Tjuta national park, Australia - May 26, 2016: Ayers Rock or Uluru, Northern Territory, Australia landscape image at night. Australia’s most iconic monolith Uluru has changed as much as you have, says Georgia Rickard. There are a few requisite expectations that come with a visit to the big red rock: namely, that it will be big, red, and rock-like. More on that in a minute, but first to the other expectations one might have about a trip here. There will be a plethora of Uluru snow-globes for sale. And that they will cost at least $25.99 each. That the coffee will be bad. And that, if you’ve seen Uluru once as a kid, then… you’ve seen Uluru. Most of us have mixed feelings about this place; the monolithic symbol displayed on every tourist T-shirt of the ’80s. Uluru itself might be an incredible wonder of nature, but the tourism culture attached to it – the not-so-cheap hotel rooms, the tour buses, the throw-another-shrimp-on prosaisms – is not. It’s easy to assume that, like so many global icons, the wondrousness of this place that’s attracted so many millions from around the world has become diluted by exactly that. If a society can be judged by the way it treats its animals, as Ghandi proclaimed, then Uluru is the barometer by which Australia can measure its progress. What goes on at our red heart is a culmination of the mores and paradigms that flow through the nation’s extremities; a direct reflection of our consciousness as a society. And today’s Uluru is not the Ayers Rock of yesteryear. Not just the rock: An Indigenous artists demonstrates how the works we see on canvas have been done for the last 40,000 years..
Where once was a place where a major airstrip was to be plonked right beside the rock – on sacred territory, no less – is now a quiet, serenely reverential national park. Gone is the old sunrise viewing platform, which crammed up to 2,500 people each morning onto spiritual ground; in its place is an environmentally respectful development, relocated to a more appropriate area. Now there is even an august date which will mark a great step forward for Australia’s cultural compass; October 26th 2019. From this Saturday forward visitors will not be allowed to ‘climb the rock’, even though it does remain open until that day – we suggest you don’t with five great reasons why you shouldn’t. In 1990, 74 per cent of all visitors climbed to the top. Three years ago, it was 38 per cent. The decision to close the climb was taken because numbers of climbers fell below 20 per cent. Progress in numbers. But back to what feels like the biggest difference: between that of the landmark I vaguely remember from primary school, and the powerfully solemn stone in front of me. The red, dusty rock I was expecting to find – the kind that covers your hands in dust when you touch it – is not red at all, but rather a deep, rich brown. The surface of Uluru is very textured. The texture is not sandy but solid. And perhaps it’s an age thing – alright, it is – but this time around I’m deeply, reverently in awe of Uluru. Not just by its height, although it’s as tall as an 85-storey building. And not because of its sheer size, though that too is worth acknowledgement, with a circumference of nearly 10 kilometres. I’m in awe because this time, I know what Uluru represents: 600 million years of time. The infinite patience of nature. The wisdom of an Indigenous culture, and their 50,000-year-old-relationship with this continent. This is an Australia that’s at once dignified, and raw, and I am torn between a desire to bow deeply to the knowledge of the culture here so long before me, or stand proud as I name it my home. Of course, there are some parts of Uluru that have not changed. The crowds of sunset viewers, the keyring souvenirs, the questionable coffee (yes, sadly). But mostly, it’s the surprises that keep coming. Walk around Uluru – a 10.6 kilometre round trip, best completed before 10am – and you’ll find a permanent watering hole, caves and Indigenous rock art. Take a tour, and you’ll be guided by someone who won’t just reel off a series of statistics – although they’re in there – but who will explain the beautiful Aboriginal stories that entwine this rock through their culture. White fellas aren’t privy to most Indigenous stories, usually, and the ones told at Uluru are basic kindergarten narratives, but each word shared tells of another, greater tale. Of a people, so long treated with disdain and disrespect, who are still willing to share. There is more to see, too, than just the rock itself. Sit a while, and notice the general abundance of life – the feathery desert oaks, the bright honey grevillea; tiny tracks of mammals and snakes in the ruby-red dirt. The sound of the breeze. The feel of the place. It sounds touchy-feely, admittedly, but there you have it – Uluru has a feel. Dinner at Tali Wiru (‘beautiful dune’ in the language of the local Anangu people), an outdoor dinner under the stars, is truly a worthwhile experience. Like its internationally famous, multi-award-winning sister Sounds of Silence up the road, Tali is a four-hour dining experience with a view of Uluru, but unlike Sounds, which caters for up to 350 people per evening across three different sites, Tali seats just 20. Outback dining room: the Tali Wiru experience, Uluru. If you haven’t decided to splash out on a $2070-a-night room at Longitude 131, this is the next best thing: the chefs and food are commandeered straight from its restaurant. Drinking Louis Roderer in the breeze while the sun sets over a fiery Uluru is not something you’ll forget easily. The star-gazing tour sounds like a fantasy of astronomy nerds, but turns out to be a life-affirming exercise in perspective. 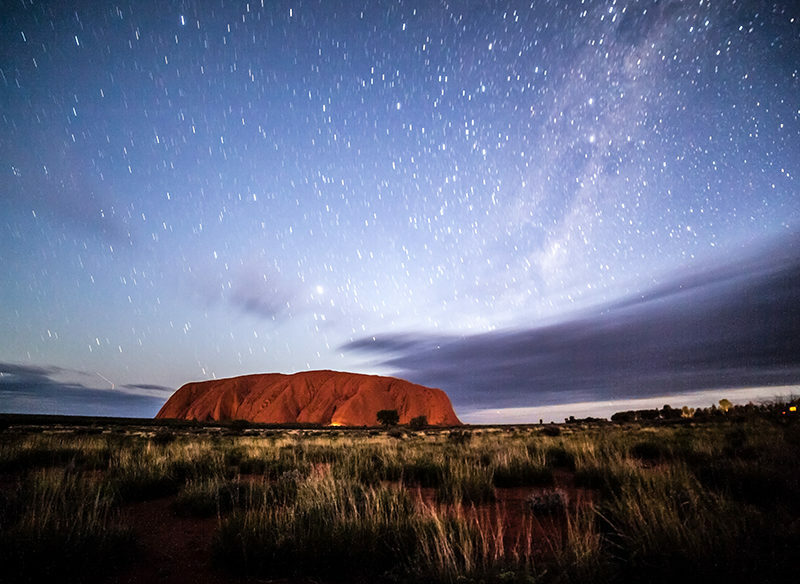 Lie back under the spread of stars – and there’s really nothing like a starry sky above the clearness of a desert – and sip your hot chocolate as astronomist Mike Dalley explains how humans, our planet and indeed Uluru were originally born from stars. If anything can cow you to the awesome vastness of our universe, this is it. And, perhaps best of all, there is a palpable sense of community here. Frankly, my expectations were no higher than the usual soulless experience at major tourism destinations – contrived ‘native’ performances – but, in much the same manner as the park’s new approach to land management, industry out here seems more mindful than that. A bush tucker tour is not just enjoyable but honestly fascinating, and has the greater effect of leaving participants with a deeper understanding of Indigenous culture. Humble Spinifex grass, for instance, reveals itself to contain a natural superglue at its roots, as strong as anything you can find at your local hardware store, as well as an entire populace of seeds, which can be ground straight into flour. The sap of some trees will crystallise into toffee. As our guide quietly pulls water, food and shelter out of the seeming nothingness around us, my sense of respect for his people grows ever deeper. A dot painting class with Lydia and her granddaughter, Beryl (both of the local Anangu people), who barely say a word but demonstrate their methods in front of an attentive class, has me so earnestly involved in painting my story that long after class has officially finished, I’m still sitting among the whispering gums, brush in hand. It is the story of my life, marked out by a series of concentric circles, some big, some small – all significant ‘meeting points’ in time – are joined together by my story line, a single (wobbly) line from one side of the painting to the other. Like so many aspects of Aboriginal culture, this is an exercise not just in pleasure, but in learning. And now there’s a concerted focus on education. Since changing hands in 2011, Ayers Rock Resort has bumped up the number of Aboriginal staff from two to over 170, with many employees hired specifically to help educate guests on their way of life via performances, talks, classes and for littlies, interactive dance routines. Whether it is this, evidence of a new era here, or the unexpected sense of pride that’s responsible for the grin on my face as I gaze out the departing plane window, I’m not sure. But this I know: the heart of Australia has never beat so well. Thank you for the information. I’m planning a visit and Uluru is one of my major focuses. I will bear in mind all this info (and have the web site jotted down).